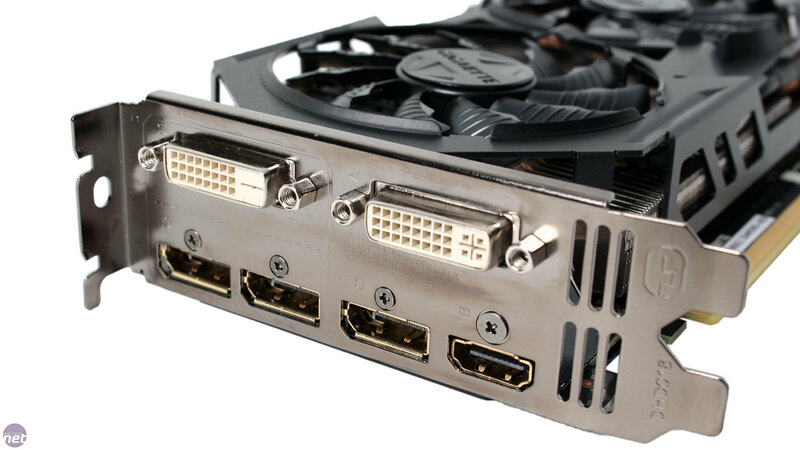 Nvidia's two tiered GTX 900 series launch targeted two types of enthusiasts – the GTX 970 aimed at the value conscious performance hungry lot while the GTX 980 set its sights on those who demand only the best. As such, the GTX 980's pricing was more inflated, a freedom it gets from having no real competition from AMD. That said, it's worth remembering that its launch price of £430 was still much lower than that of the GTX 780 Ti at launch. Reference cards can still be found at this price, but custom made ones courtesy of Nvidia's board partners demand a premium. 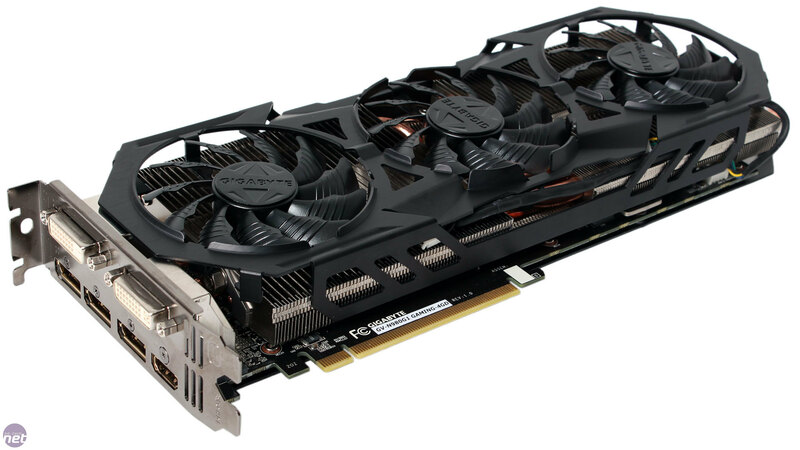 The GTX 980 Gaming G1 from Gigabyte is one such card, and at £500 it's one of the most expensive GTX 980s on the market, coming in with a 16 percent mark up, so hopefully it offers us many good things. 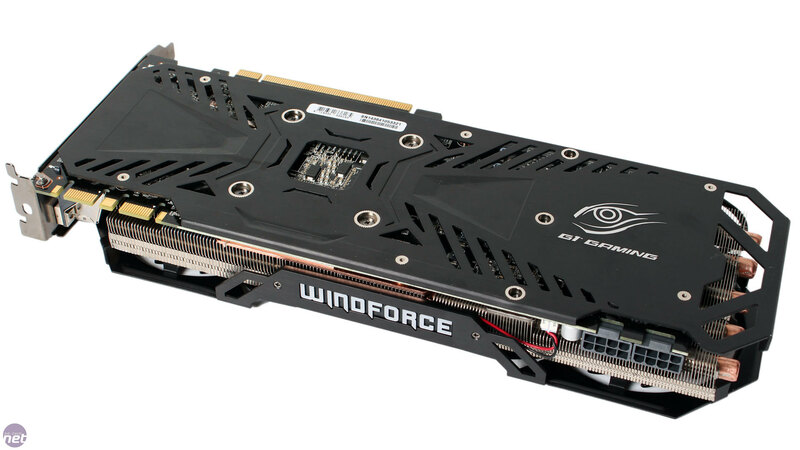 The latest edition of the Windforce 3X cooler is the stand-out feature, and it makes the card rather beastly. It measures 300mm long and weighs over 1kg. 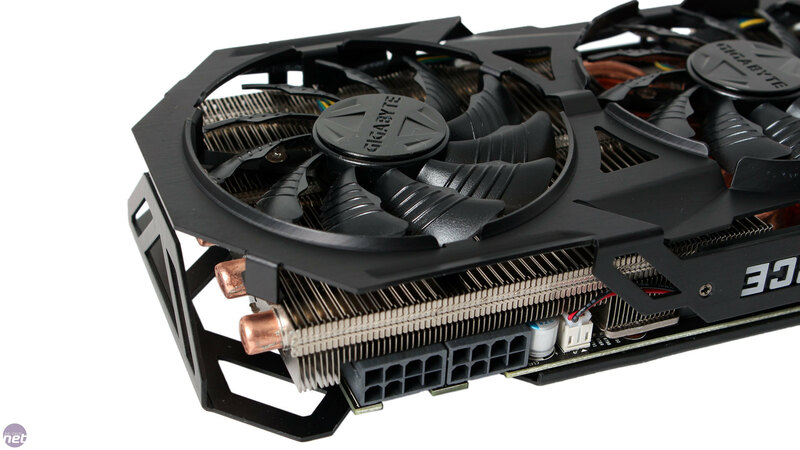 It's also rated to deal with 600W of heat; we're not entirely sure where Gigabyte pulled this from but judging from the size and weight alone we have little doubt that it will be able to cope with the 165W TDP GTX 980. The build quality is exceptionally high. 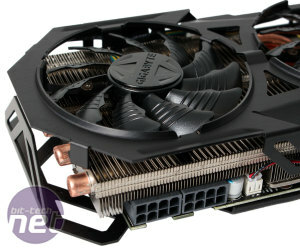 The cooler shroud is formed from rigid, brushed metal, and the same is true of the backplate as well, in stabilising the card against its own weight. The Windforce logo along the top edge of the card is backlit by blue LEDs. This will look good through a case window, as will the aggressive design of the backplate with its angled slits. The backplate has no removable section like the reference model, but these slits should serve a similar function in allowing air to circulate across the back of the PCB in SLI set-ups. 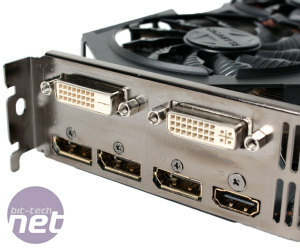 SLI users will also be pleased to note that the cooler does not extend outwards over the SLI connectors, so fixed position bridges will fit without issue. Accompanying the card is two cables. One converts two Molex connections into an 8-pin PCI-E one, while another converts another pair into a 6-pin PCI-E plug. The inclusion of this latter cable is somewhat daft (or perhaps an early packaging mistake) since a quick glance along the top of the card reveals two 8-pin sockets. Gigabyte has thus equipped the card with the ability to draw more power than the reference model, which only has two 6-pin sockets. Gigabyte has kept all five of the reference display outputs, but has also added a dual-link DVI-D connection, calling the new configuration Flex Display. Using this new port will disable the two DisplayPort connections next to it, and whatever configuration you use you'll still only be able to run four displays at once. As you'd expect, the card ships with a factory overclock, a 9 percent one to be precise, which leaves it with a base clock of 1,228MHz and a boost clock of 1,329MHz. Gigabyte uses a binning process it calls GPU Gauntlet Sorting to select GPUs for the G1 Gaming range, choosing only those with the best power efficiency. This would help explain the inflated price tag; hopefully overclocking the card proves very fruitful as a result. Sadly, Gigabyte has left the memory clocked at 7GHz effective. This is hardly slow, but for £500 it would have been good if Gigabyte had been able to select premium memory chips and offer its card with overclocked memory to differentiate it that little bit more. 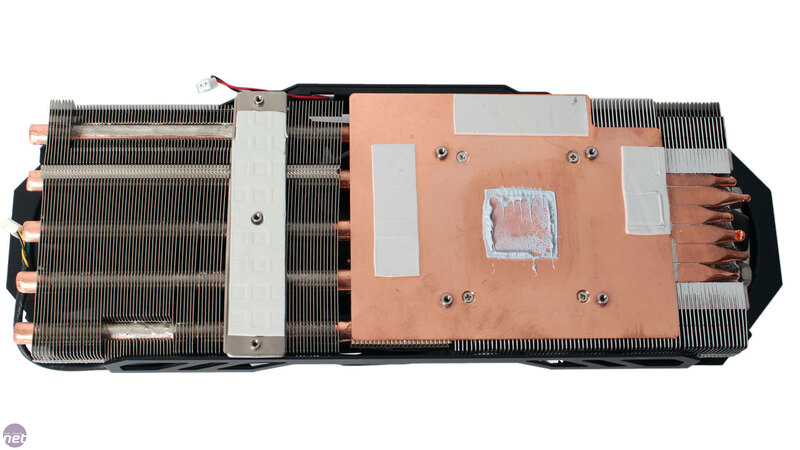 The open-air cooler design and closed off rear I/O panel means all hot air from the GTX 980 G1 Gaming will be dumped into your chassis, so a solid exhaust system is a must, especially if going SLI. Air is moved by a trio of 80mm fans with a unique blade design, whereby the small triangle splits the air between the ridges, supposedly to improve airflow while reducing turbulence. 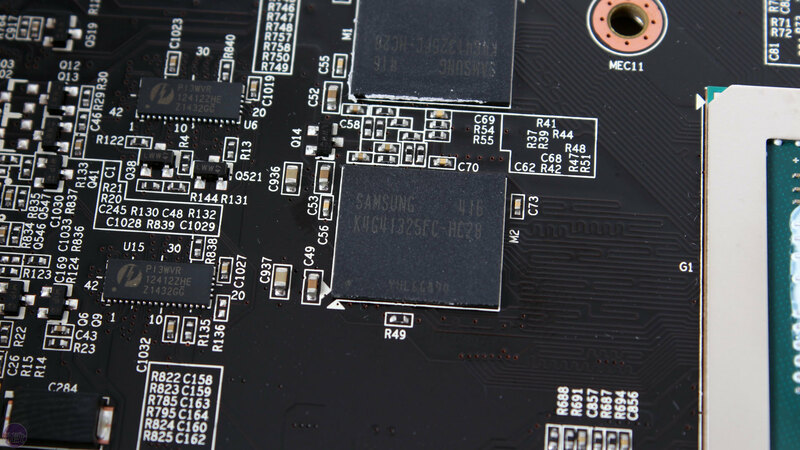 The fins on the heatsink are densely packed, and are fed by a whopping six heat pipes (five 8mm, one 6mm) that run through a huge copper baseplate. 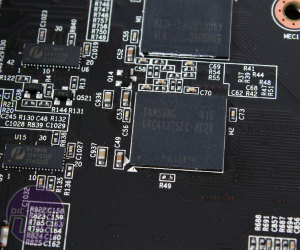 The memory chips and MOSFETs are all directly cooled as well using thermal pads. The PCB is sparse in places but the power circuitry forms what appears to be a 6+2 phase power system, an upgrade from the reference 4+1. Gigabyte uses Japanese solid caps, ferrite core metal chokes and low resistance MOSFETs as part of its Ultra Durable VGA technology. Gigabyte's new Xtreme Gaming series aims high with its specs - how does the GTX 950 version hold up? Yup, that's three GTX 980s - for £2,499.95.